The Sun marks the year at four clear points called the Quarter Days – in the Northern Hemisphere – the Winter Solstice (longest night), Spring Equinox (equal night and day), Summer Solstice (longest day), and Autumnal Equinox (once again, equal day and night). The Celts divided the year in to eight by inserting the four Cross Quarter Days at roughly November 1st (Samhain), February 1st (Imbolc), May 1st (Beltane) and August 1st (Lughnasad). These points are roughly half the number of days between the Solstices and the Equinoxes. Samhain (Halloween/All Saints Day) is the end and beginning of the Celtic year. By November 1st, the harvest is in and the seeds of the winter crops are planted. These seeds will lay dormant until Imbolc, called Candlemas by the Church, at the beginning of February when (in the British Isles) they move by themselves for the first time. The seed now has demonstrated that it is a living entity on its own. By Beltane, May Day, the plants are up and fertility is of extreme importance. Then at August 1st there is Lughnasad, Lammas in the Christian calendar, when the harvest begins. All the crops should be in by Samhain (pronounced "Sow-an") when the cycle begins once again. The sow / female pig was sacred to the Celts for her fertility. Of course 'sow', the pig, and to 'sow' seeds, while they pronounced differently, they are spelled exactly the same. An, of course, Samhain (sow•wain) is when the seeds are planted for next year's crops. If the Quarter Days start a season on the cycle (Winter Solstice starts winter, Spring Equinox starts spring, etc. ), the Cross Quarter Days mark the high point of each season. For example, in Vermont (USA) where I come from, the old-timers say that you should have half your hay and half your wood by Candlemas (Imbolc). We also have our coldest nights (40 to 45 degrees below zero) just before the first of February. With this end/beginning cusp, Samhain is the time in the yearly cycle of the Celts when the veil to the other side is the thinnest. It is the time of ghosties and ghoulies and things that go bump in the night. All Saints Day is on the 1st of November. It is a time to remember the dead – all the Saints. And of course the night before is Hallow 'een. I'll never forget a Samhain in Chagford, a small country town at the edge of the northeast corner of Dartmoor in Devon. In the mid-eighties I had the good fortune to live in Glastonbury for almost two years. I went down to Dartmoor to visit old friends – the sacred sites of that magical moor. In the afternoon of the of 31st of October I was out on one of my most favorite sacred landscapes in all of Britain – Gidleigh Common with Kestor (a massive natural rock outcrop at the edge of the moor), the Shovel Down Stone Rows, the Teign River with its Iron Age Clapper Bridges and massive holey stone, and lovely Scorhill Circle on the side of the hill beyond the river. All of these ancient sites were folded gently in to the rolling hills of Dartmoor. I've been on Gidleigh Common in all kinds of weather from barefoot and shorts to hail coming in sideways. On this particular Autumn afternoon, the Sun was shining brightly as I was walking from Shovel Down towards the River Teign. Some clouds scudded along the rocky outcroppings, called tors, to the West. As I crossed the Common, I became aware that the farmers were bringing in their sheep. First, all I heard was their whistling, as they instructed their sheep dogs. Then I saw them, riding ponies with nothing but a bridle and a girth with stirrups, the herdsmen and their tireless dogs were driving their sheep off the moor down to more hospitable terrain for the winter. According to Celtic tradition, Samhain was the day by which this task should be completed. Chagford is a wonderful little town just off Dartmoor that has a marvelous village square with a nationally known bank with a thatched roof, one of the best hiking goods stores I've ever seen anywhere, The Three Crowns (an ancient inn with funky rooms and interesting food), and other typically British shops like a chemist, veg store, several small tea rooms, and the Post Office. Just around the corner from the village square was the Chagford Church, a fine Anglican sacred space whose age would have been reckoned in multiples of hundreds of years. That same day I saw the sheep being herded off the moor, after a fine evening meal of Vitamin M at the Three Crowns, I went for a walk through the village, and took a short cut through the Church yard with it's ancient tomb stones. By that time, it was quite dark with the streetlights blinking through the grave yard trees and illuminating only a few of the old grave stones. Needless to say, every costumed kid in town was hiding in that cemetery, and they had been waiting all evening for a sucker like myself to walk through the grave yard. At least ten ghosties and ghoulies jumped me from behind various stones! It was great to encounter the startling "Boo!" and the ensuing peals of laughter. What a way to experience Samhain! Goddess was found in a trinity in the Celtic world. As a Virgin, we first see her at Imbolc as Bride/Bridget. In her Mother aspect, we see her at both Beltane and Lughnasad. But it is here at Samhain that we meet the Goddess in Her third aspect, one that causes the most problems for many of us: the Crone. Our patriarchal society (of which the Celts were an earlier part) has consistently devalued women, and, today, as never before, the focus is on youth while our elders are ignored. During the early Renaissance, older women – especially if they lived alone or if they were a bit eccentric – were many times singled out as witches and burned at the stake. Now there is an aspect of the Crone that is unpleasant to contemplate. The Hindus – at the other end of the Indo European empire - called her Kali (Ka-lee), the Death Goddess. The Celts in Scotland called her Cailleach (Kal-eh) which simply means "old woman." Images of her can make any night unpleasant. She had a blue-black face, one eye in the middle of her brow, and protruding teeth. A real beauty! Yet Cailleach is an important part of the cycle of birth, life, death, and regeneration. Her power animal was the Boar. The pig was always seen as a sacred animal to the Celts. For this reason, some Highland Scottish people, the Caldones or Kaledonioi, do not eat pork. And Samhain is both the time of death, and the time to sow the seeds. Interesting linguistic coincidence. There is another, more agreeable aspect of the Crone that we must not forget: that of the wise old woman. Our Grandmothers (and Grandfathers) carry the wisdom of our people. Just as the Haudenosaunee (Iroquois) of New York whose older women, the Clan Mothers, pick the Chiefs, all of the Celts from the Gaels and Picts of Ireland and Scotland down to the Gallacians in Turkey had a councils of elder women who chose their kings and war leaders. We need to redevelop ways of incorporating Crone energy in to our lives as well. Taliesin, the most famous of the Welsh Celtic magicians, received his magic and inspiration from the Crone Cerriddwen. While she had her devouring aspects, she also had a cauldron of plenty. (An archetype of the Holy Grail.) Cerriddwen had hired a local lad, Little Gwion, to stir her cauldron for a year and a day (thirteen lunar months plus one day equal 365). On the last day, the potion boiled over and three burning drops fell on Little Gwion's hand. As he licked his burnt hand, the boy received the full dose of knowledge and wisdom that had been brewing in that cauldron for a year (and a day). After many adventures including a breathtaking chase scene and a miraculous rebirth, Little Gwion was transformed into Taliesin, the greatest Magician in all of Wales. We all come from Goddess And to her we shall return Like a drop of rain Flowing to the ocean. All of the Celtic Cross Quarter Days are Fire Festivals. Shortly after November first is Guy Fawkes Day on the 5th of November. Fawkes tried to blow up Parliament when King James I was in the building. The gunpowder was in place when the plot was discovered. Now Guy Fawkes Day is celebrated with fireworks (it's like the 4th of July in the U.S.), and big fires are lit and effigies of this poor guy Fawkes are burned all over England - shades of the wicker man. While all of these Cross Quarter Days are all Fire Festivals, I feel each of the Celtic Cross Quarter Days is also associated with one of the four elements for the purposes of scrying. At Imbolc one looks at a bowl of Water to scry the future. Beltane is the time to look in to the Fire and burning embers to ruminate about the past. Lughnasad/Lammas uses a bowl of Earth to look at the now. The element of Samhain is Air. The veil to the other side is so thin at this time that you can see the spirits in the Air. You don't need any scrying tools! Use the intuitive skills you already have inside. Be sure to use protection if you plan to scry at this time. You can do this by surrounding yourself with Love. Only Love may enter. All else will be turned away. Just Exactly When Is Samhain? There are a number of different answers to this question. In these four articles on the Cross Quarter Days, we will be exploring a number of different ways to determine this day. Of course, the most commonly accepted date is November 1st. Half the number of days between the Autumn Equinox and Winter Solstice this year (1996) is November 6th. Astrologically, the half-way point is Fifteen Degrees Scorpio is also on November 6th this year! 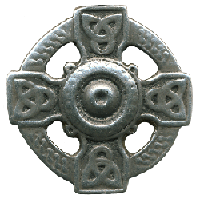 Serena Roney-Dougal has told me about the Coligny Celtic Calendar that was found as a bronze plate in Brittany that dated, I think, from about the first century CE. This cycle of the year is linked to the quarter of the Moon and the time of the day. Imbolc is celebrated at midnight at the new Moon nearest the beginning of February, Beltane at dawn on the First Quarter Moon nearest the beginning of May, Lughnasad at mid day on the Full Moon closest to the first of August, and Samhain was celebrated at sunset on the Last Quarter Moon closest to the first of November. For example, using this system, Samhain 2002 is at sunset on October 28th. Remember, there is no right date for these moveable feasts. It is a window in time. Which day resonates best with you? Go with your guts on the choice. There is one thing to be said about the Cross Quarter Days regardless of exactly when you place them. These are the times of year when most everyone really becomes aware that the length of the daylight is changing. At Samhain, the days are getting shorter. At Imbolc the darkness breaks, the daylight hours are getting longer. At May Day you first become aware of how much later the Sun is setting in the evening, and at Lughnasad, for the first time you really begin to notice that those long summer evenings are beginning to get a bit shorter. The Quarter Days mark the beginnings of the seasonal changes, and the Cross Quarter Days mark the midpoints. There is a traditional activity associated with Halloween that can be a very effective ceremonial tool at Samhain. It's bobbing for apples. This is an age old tool for communicating with the other side. Water represents that veil that is so thin at that time. Apples have always been associated with Goddess and temptation. Let me tempt you if I may with a technique that might yield some interesting results. At your Samhain gathering, have a big bucket or cauldron, some room temperature water, and a number of largish apples. So as this Samhain approaches, what is ending in you? What do you have inside that it is time to let go of? No healing is complete until you get beyond recovery. Use Samhain to take the thirteenth step: Transformation. In the Tarot, the thirteenth card of the Major Arcana is Death, and it is ruled by Scorpio. Samhain occurs in Scorpio. The card of Death doesn't necessarily mean physical death (though it can mean that), but more productively, it can be seen as an inevitable heavy change or transformation. Something old must be gotten rid of to make room for something new to be able to come in. Use the magic of this time to say good-bye to an old habit or addiction, an old relationship, or anything else it is time to leave behind.